Ok, so where do you get this stuff? The expensive cooking store: Sur La Table. Not as expensive places: Walmart, a hardware store, or local grocery store...just ask someone. Also, there are quite a few places online that will sell you the kit (without the jars and lids) Check here. My favorite way to get jars and lids is to place a wanted ad on craigslist. I found a lady that lived out in the country who gave me 6 boxes for FREE because she was done canning; her kids were grown and out of the house. Alright, let's get started. I doubled the salsa recipe and it fills 7 1-liter jars, which is exactly how many fit in the water bath canner...perfect!! Wash your jars and rings (not the lids) in the dishwasher. Make sure that none of the jars are chipped or nicked. Next, put the jars in the wire rack. Lower them in the water bath canner and fill with water. Make sure the water covers the jars by an inch. Put the lid on and bring the water to a boil. Boil the jars for 10 minutes...this will sterilize the jars. Meanwhile, put the lids and rims in a saucepan, fill with water and simmer until needed. After the jars have boiled for 10 minutes use the jar lifter to take each jar out one at a time, pouring the water down the sink. Don't pour the water back in the canner because it will overflow when you put salsa-filled jars back in the water bath. Oh...and be careful!! The water and steam will be very hot! Arrange the jars on a kitchen towel making sure they don't touch. 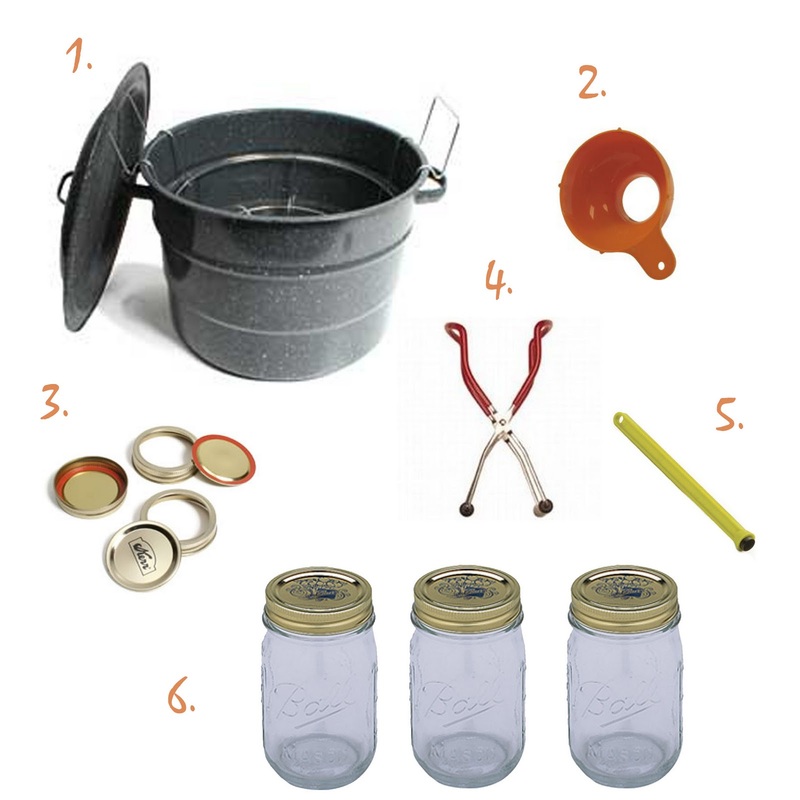 Fill the jars by using the wide mouth funnel and a ladle. Leave about 1/2 inch of "head space" which mean fill 1/2 inch from the top of the jar. Next, use a wooden stick or skewer to go around the inside of each jar. This will remove the air bubbles in the jars. Now it's time to use the magnetic jar lifter to place each lid on the jar followed by a rim. If you notice, I've used two types of lids with these jars: 2-piece lids and one-piece lids. It doesn't really matter which you use. The 2-piece lids can be recycled by using the rims again and just buying new lids. The 1-piece lids are a bit more expensive, not recyclable but maybe easier to get on and off. Screw each lid on, but NOT TIGHT, just enough to close it with a little pressure. Use the jar lifter to place each jar back in water bath. Close the lid, bring back to a boil and set the timer to 15 minutes. Once the timer goes off, your salsa is processed! Yay. CAREFULLY, take out each jar and place it on a kitchen towel, again, making sure they are not touching. Remember the water, jars, and steam are all very hot. Now it's time to be patient. Leave the jars untouched for 24 hours. After that time each jars' lid should be sealed. The best way to tell is if each lid is concave and won't "pop" if you try to push it in. If one is not sealed you have three options: 1. Open, eat and keep in refrigerator until gone 2. Give to a friend for immediate use (again storing in the fridge) 3. Re-process in boiling water for another 15 minutes with a new lid. If it doesn't seal the second time there is most likely an issue with your jar. Note: Water bath canning is suitable for contents that are considered "acidic" (pH level below 4.6). Before you process something other than the salsa in the prior post, check for updated processing times and if water bath canning will preserve your contents correctly. For less-acidic (base) contents you will have to use a different process called pressure-canning. If I thought it would get there by this week I would! Everything has stopped in Dallas too...they just shut off our water!